There was no lack of snow to provide a wintery setting for the start of the Games. The heaviest snows since pre–war years plastered St. Moritz the day before the Opening Ceremonies. An all–night blizzard ended at dawn on the 29th, leaving a foot of fresh snow on an earlier blanket of four feet. It messed things up for the clearance gangs already laboring to get the venues into shape for the games. We were told that the press back in Canada had picked Czechoslovakia as the hockey favourite, followed by Sweden and Switzerland. Canada would do very well if it finished fourth. 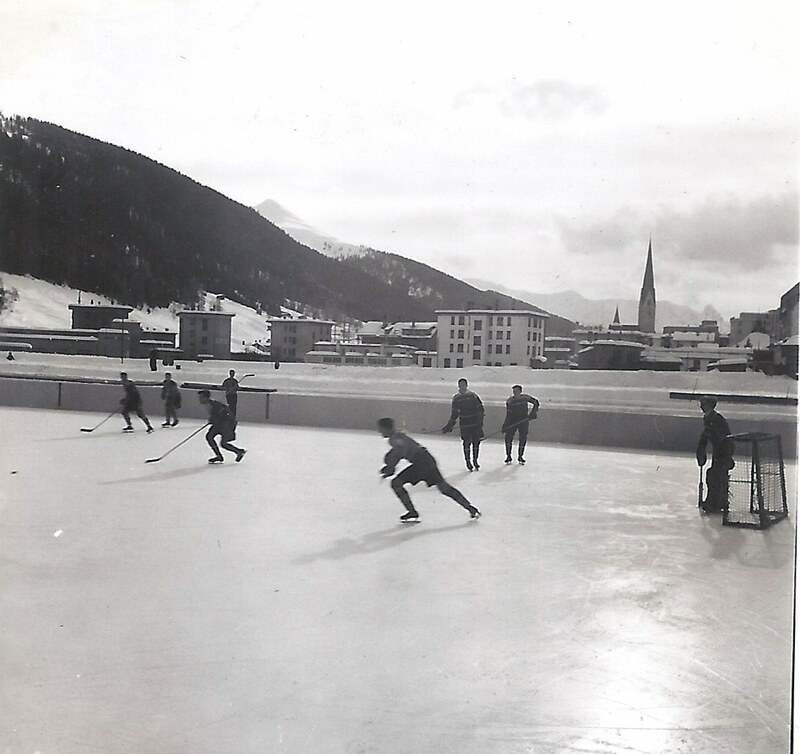 PRACTICE: We had our first practice on St Moritz ice today with a 2 hour workout. We found out that the Swiss lacked mechanical devices to clear the rinks. A number of the players complained of short windedness due to altitude but overall Coach Boucher seemed satisfied with the condition of the team. TEAM MEETING – ‘PILE UP THE SCORE’ AS MUCH AS POSSIBLE: We had a brief team discussion talking about our strategy for the games. Coach Boucher repeated the advice provided by Bunny Ahearne back in England and added a few additional points. Given that we were almost universally rated as underdogs, with at least 3 other stronger teams that the ‘expert commentators’ picked ahead of us, it was essential that we piled on the goals no matter what the score differential. Then there was the refs – who at that time were an unknown quality – but which later would turn out to be the most important factor. The foregoing was the Coach’s and thus the team’s mindset going in. We wanted to win. We wanted to prove the naysayers in the press, who had hounded us all the way to Europe, wrong. We knew the spotlight was cleared focused on us – certainly for the wrong reasons. The "I told you so" articles were probably already drafted. The team had something to prove! DECISION NOT TO MARCH IN OPENING CEREMONIES & IMMEDIATE REVERSAL: It was after our practice on the 29th that Manager Sandy Watson decided that our team would not march in the Opening Ceremonies the next morning. Essentially he was worried that the 3 hour or so procession would be too exhausting for the boys – who had already complained of short windedness in the practice today. He wanted the players rested and ready to go when the team took to the ice against the top rated Swedes. When George Dudley heard of this decision he quietly explained to Sandy that this opt–out was not going to happen and all of the players would be marching in the Opening ceremonies tomorrow – outwardly showing a great deal of spirit and pride – and that was the end of that! One terrific storm–the prolonged controversy over which U. S. hockey team would compete – cleared on the eve of the fifth Winter Olympic Games, but a severe snowstorm presented another threat to the scheduled opening tomorrow. A decision to eliminate ice hockey from the games, reached by arbitration between the International Olympics Committee and the Swiss Organization Committee late last tonight, cleared the way fore the starting of activities on schedule, with a full entry of U.S. teams. Included in the more than 10,000 visitors to the games, representative of virtually every nation in the world, will be more than 1,000 men from the U.S. Army in EUCOM. 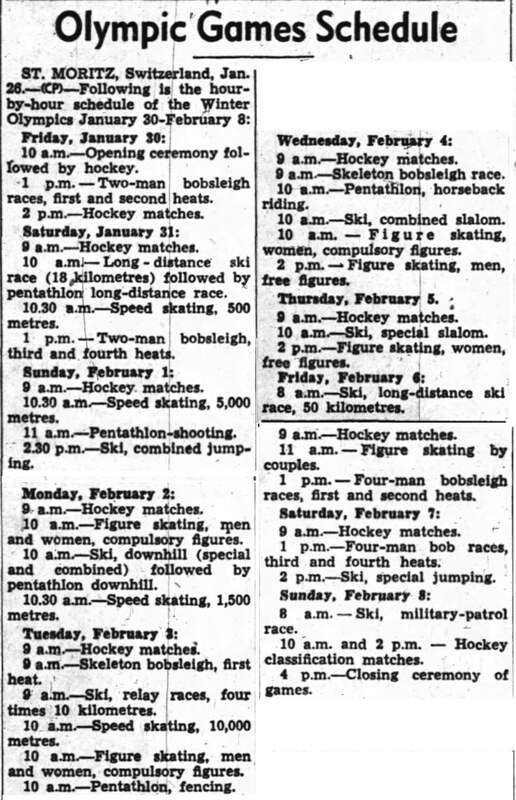 Opening ceremonies are slated at 10 a. m.
Due to elimination of ice hockey, originally scheduled for both the morning and afternoon, the only other opening–day competition will be two–man bobsled races starting at 1:00 p.m.
A three–man arbitration committee representing the IOC, arrived at a settlement of the ice hockey dispute less than 15 hours before the scheduled start of the contests. The decision to omit ice hockey from the games and permit all teams gathered here to compete in a “world championship” satisfied the previous objections of the U.S. Olympic Committee headed by Avery Brundage. Until it was reached Brundage had refused to back down on his threat to withdraw all U.S. teams if the Amateur Hockey Association was accepted officially by the Swiss as the U.S. entry. The decision settled the bitter jurisdictional dispute in the Olympics history – a dispute that started in November when the Swiss Organizing Committee certified the AHA team. Brundage termed the AHA team a "professional" team sponsored by private promoters. That led to the showdown fight, and neither side budged an inch in its position until tonight. "This victory should be welcomed by all countries of the world where the cause of amateurism is cherished. The argument against our position centered on technicalities and missed the heart of the issue, which is the question whether commercial sports can invade the Olympic program." "The action," Brundage added, "shows conclusively that the danger was appreciated and action was taken to safeguard the integrity of the Olympic Games." ...............The sub–committee had voted to bar both the AHA and AAU teams. During the day–long session of the IOC, angry voices were raised frequently and there was considerable banging of fists on the tables. At the height of the wrangling, M.J. Sigfried Edstroem of Sweden, head of the IOC, had sounded firm and gave warning that unless the squabble was settled the games conceivably might be called off. "The executive committee acts as a jury of honor on questions of this kind and cannot be vetoed." Brundage was asked if he was pleased with the decision. "I am always happy," he said. "It is unfortunate that things like this have to happen and it was very unpleasant, but the U.S. Olympic Committee always felt that fundamental principles could not be compromised." The U. S, Olympic Committee had never insisted that its team compete, but opposed only the entry of the Amateur Hockey Association. Of course the Swiss were wringing their hands in anguish. What would the Winter Games be without hockey, so rewarding at the box office to the anxious inn–keeping sponsors? We could not believe it. We had gone through hell to get to St. Moritz and Olympic hockey was cancelled! Everyone who had a badge, a temper and a yen for authority seemed to be taking part. The U.S. Olympic Committee and the International Ice Hockey Federation were supposed to pick the U.S. team jointly, but since they were backing rival teams, two teams were sent to Switzerland, neither properly accredited. At the peak of the bickering, stuff–shirt Avery Brundage, the U.S. Olympic chairman, issued a pompous communiqué announcing that "a great victory has been achieved...." but he proved to be the only one who thought so. The International Olympic Committee sided with Brundage. But the Swiss, who as hosts were in charge of the Winter Olympics, sided with the other team. Result: hockey is being ruled out of the 1948 Olympics! We were to encounter close and personal Olympic politics and grandstanding at its ugliest. The Swiss Olympics Organizing Committee tonight rejected the International Committee's decision to ban the Amateur Athletic Union and the Amateur Hockey Association in the winter Olympics. The Swiss Committee reiterated its earlier decision that the Amateur Hockey Association should participate. The Swiss committee voted not to accept the earlier decision of the International Executive Committee which refused to accept either the AHA team, previously accepted by the Swiss Committee, or the Amateur Athletic Union contingent which is supported by the U.S. Olympic Committee. The Swiss Committee stated it alone was competent to rule on acceptance or cancellations of Olympic entry applications. This leaves open the dispute on competence between the International– Executive Committee and the Swiss Organizing Committee.